An industrial grease gun is used to deliver just the right amount of lubrication to bearings, right where it’s needed. 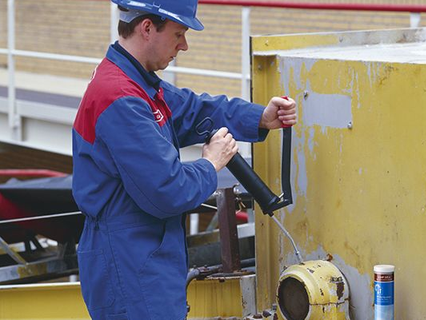 To a shop maintenance professional, a good grease gun can be their best friend—saving time, saving money, preventing downtime and extending bearing life. In determining which industrial grease gun is needed for the job, compare the various features that each style has to offer. The first category, manual grease guns, is made up of two types: the lever gun and the pistol gun. The lever grease gun has a mechanical advantage that develops high pressure. 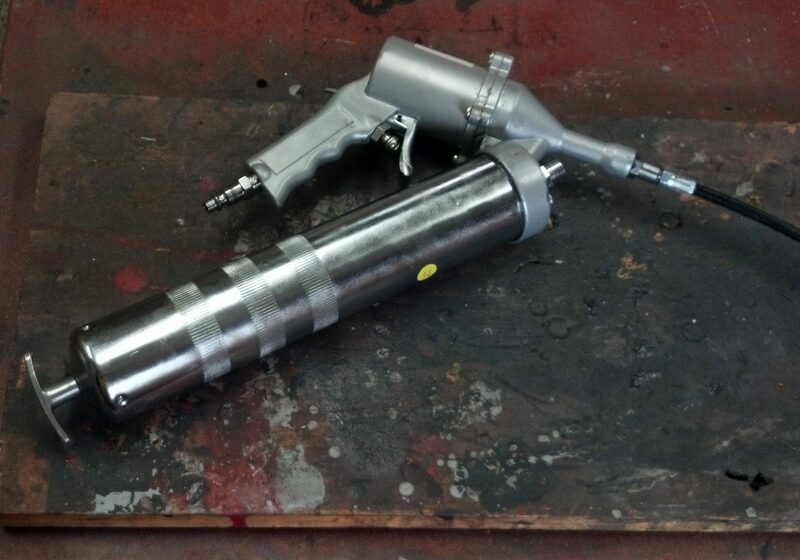 The need for precise tolerance and hardened machined components is critical with this type of grease gun. The lever gun is the best option for heavy industrial use such as mining, cement, pulp and paper and steel. A lever grease gun with a high output of grease per stroke, but produces lower pressure, is the best choice for applications involving large bearings that have more clearances for grease to flow. For industrial applications with smaller bearings, a lever grease gun that produces higher pressure but less output volume is ideal. The pistol grease gun has less mechanical advantage and develops less pressure. As a result, the need for precise metal-to-metal, close-tolerance fit is not as critical. The pistol grip grease gun can be used for non-industrial applications such as for small tractors and automobile maintenance. The pistol grip grease gun usually provides lower pressure (500 psi) and lower output per stroke. The second category of industrial grease gun is characterized by pneumatically and electrically-operated guns. An electric grease gun is a useful tool for those who operate heavy equipment and machinery. The gun injects heavy lubricating grease into machine parts and can be used with ease on both light and heavy equipment. Electric grease guns are generally more affordable than pneumatic guns, but do not create as much noise. Additionally, while power cords can be an added hindrance, their lightweight nature lends to increased comfortability and mobility during use. It is also important to note that electric-powered guns are high-maintenance tools. The component parts, specifically the motors, of the guns have a higher wear-and-tear rate. These days, though, battery-powered grease guns are the way to go. Cordless electric power tools are so easy to use and very convenient. With major improvements in both battery and electric motor design, these tools now offer much longer working times than older versions. 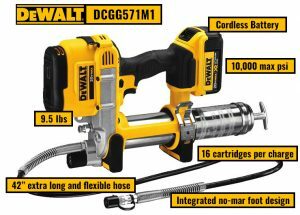 With a powerful motor blasting 10,000 max psi through clogged grease fittings, the DeWalt 20v max* lithium ion grease gun performs up to 50% faster than manual grease guns. These models are designed with an innovative pump filter screen that prevents dust and debris from entering the pump mechanism, extending the life of the unit. It also has built-in LED lights to illuminate darker areas and a base that allows it to stand upright when you place it down. Pneumatic grease guns have a high power output, which means lubricating equipment more effectively, completing jobs quicker and with less energy. Since they’re powered by compressed air, rather than electricity, they’re more dependable and result in lower operating costs. Additionally, the guns aren’t affected by moisture or water. The well-regulated air flow increases the life of the motor, and therefore, fewer high-wear parts, contributing to longevity. However, pneumatic guns generate a lot of noise during use and require sufficient hearing protection. The hose attachment, if not handled well, can also cause an accident. It may get entangled on an item or cause one to trip if not alert. Although pneumatic grease guns are portable, you have to carry the compressor with you, which can be large at times. Hardened bushing and plunger with metal-to-metal clearance that fits in the .0001 (one ten thousandths of an inch) allows for the pressure to be developed and prevents bypass of lubricant during high pressure from the piston chamber. This prevents grease from back flowing into the piston chamber. If this occurs, the grease will not get to the bearing and the grease gun will not prime. This allows air to be expelled, thus the grease gun will not lose prime. This is an important feature when air is introduced in the grease; usually during the refill process. This allows for sufficient hardness for the purpose of wear resistance to maintain tight clearances between the piston and plunger, extending the grease gun’s ability to produce and maintain pressure over time. The three filling methods are bulk, remote and cartridge filling. An elastomer follower-type seal that is or can be configured to seal in two directions and accommodate a standard grease cartridge is ideal. For bulk and remote filling, the seal must prevent grease from bypassing the follower in the grease gun from the top. For cartridge use, the seal must accommodate the grease cartridge tube. An opening large enough is needed so that it does not restrict flow of grease from the cartridge tube to the piston chamber. This is especially important when operating the industrial grease gun in cold weather. The size of the orifice must be large enough to allow for flow of grease under cold temperature conditions. Typically, this means .045 inch thick wall steel tubing or greater is needed to ensure a rugged design. This provides a reliable seal connection by gripping the ball of the fitting; and as more pressure is required to force the grease through the fitting, the tighter the seal will become, thus preventing leakage. Due to the high pressure produced by professional grease guns, it’s essential to use an outlet hose or rigid extension pipe that is rated for the pressure the gun can produce. This is especially relevant for a hose. If an extension pipe or hose is not strong enough to withstand the pressure that is being developed, then the hose or pipe could burst, causing high-pressure grease or fragments to release violently and cause injury or other damage. When used properly – which means with the right lubricant, right fittings, and in a safe and careful manner – the maintenance pro can cut his lubrication jobs down to size while ensuring increased intervals between major repairs and reducing unplanned downtime. For as simple as it appears to be, an industrial grease gun is an impressive and sophisticated tool. 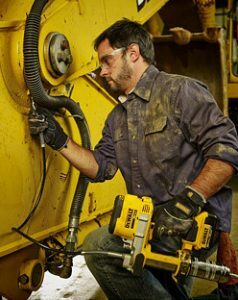 IBT’s General Industrial Group is your complete source for industrial and maintenance supplies and services, backed by unsurpassed customer service and brands, like DeWalt, that you know and trust. PLUS━with all DeWalt Power Tools, you always have the benefit of the DeWalt 3-year warranty, 1-year free service plan and 90-day money back guarantee. 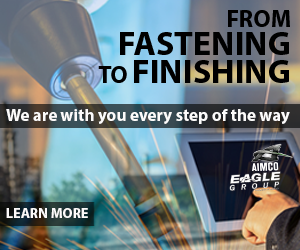 We’re dedicated to meeting any and all of your industrial tool and product demands. For more information on selecting an industrial grease gun, or for other lubrication questions regarding automated systems and maintenance services, contact us today or give us a call at 913-677-3151!